Make sure you use a good indoor/outdoor glue if you are going to display these outside. I give you my recommendation over at the blog for a glue that has worked awesome for me. These are sooo adorable! Anyone else made this and can post a photo?? How beautiful is this entryway unit with bench seating, storage and coat rack all in one?! LOVE the use of two doors... I have seen lots of single door versions but this one takes the cake! Do you like it?? 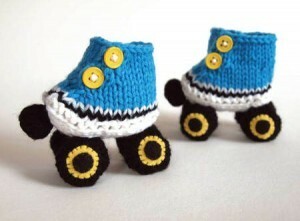 How cute are these roller sakte booties? Absolutely adorable. Craftfoxes shares the pattern so you can knit these for your littlest skaters.They can be any color you want and would make a really neat baby shower gift. Want to make your new years eve hats yourself? Check out these diy 1930′s style hats made from crepe paper. The tutorial and instructions are shared by Rook No 17. I like them, its a nice change from the pointed hats every one has every year. Remember to change the year. Want to try making your own soaps? Here are 71 of the world's best recipes all in one convenient place! Share this with your soap making friends so they can check it out!